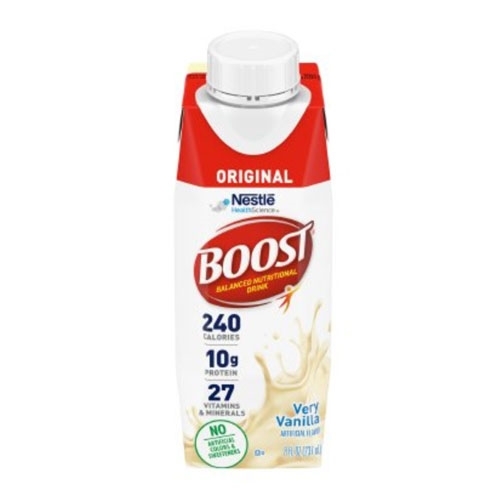 Nestle Boost® Original Complete Nutritional Drink is a delicious beverage that supplies 240 calories, 10 grams of high quality protein and 26 vitamins and minerals in each 8 ounce serving. Stay strong, stay active with Boost available in three great flavors - Very Vanilla, Rich Chocolate, and Creamy Strawberry. Boost® Original contains CalciLock, a blend of essential nutrients to help support bone health. CalciLock is a combination of essential nutrients to help build and maintain strong bones. This nutrient blend includes calcium, phosphorus, magnesium, zinc, and vitamins D.C, and K and is designed to help support healthy bone development. Boost® also includes Antioxidants (Selenium, Vitamins C & E and beta carotene) to help support a healthy immune system. 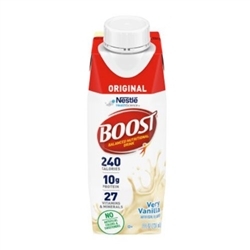 Boost® Original is appropriate for: Lactose intolerance (not for individuals with galactosemia), gluten-free, low residue, and kosher. Boost® provides nutritional support for malnutrition, inadequate oral intake, and/or reduced appetite. It is not for parenternal use. Boost® Original is packages in 8 oz Tetra Brik containers. Detailed nutritional information can be found on the Nutritional Information tab of this product page and the ingredients are listed on the Ingredients tab. Water, Corn Syrup, Sugar, Milk Protein Concentrate, Vegetable Oil (Canola, High Oleic Sunflower, Corn), Soy Protein Isolate, and less than 0.5% Magnesium Phosphate, Potassium Chloride, Cellulose Gel and Gum, Salt, Calcium Carbonate, Soy Lecitin, Sodium Ascorbate, Choline Bitatrate, Calcium Phosphate, Natural and Artificial Flavor, Alpha-Tocopheryl Acetate, Carrageenan, Ascorbic Acid, Ferrous Sulfate, Zinc Sulfate, Vitamin A Palmitate, Niacinamide, Vitamin D3, Calcium Pantothenate, Manganese Sulfate, Copper Sulfate, Pyridoxine Hydrochloride, Thiamine Hydrochloride, Beta Carotene, Riboflavin, Chromium Chloride, Folic Acid, Biotin, Potassium Iodide, Vitamin K1, Sodium Selenite, Sodium Molybdate, Vitamin B12. I ordered 4 cases of Boost , 3 arrived in a speedy manner. Checking the invoice, it only showed 3 cases being shipped. I also saved the UPS label on the cases showing 3 cases being delivered. When the 4th case didn’t arrive I notified them of my findings and they asked me to double check. I explained to them that we did and that I also had proof from the UPS label and invoice. Once they noticed it was their error, the case was shipped out and we received it a few days later. In any event I always save receipts and labels until our orders are received. In this case, it was important to have these products ASAP because they were for my special needs grandson. I would order from this company again because the products are reasonably priced, fast shipping and received in good condition. But more importantly their customer support team had a fantastic response time and was very competent in rectifying the situation and they didn’t know the Boost was for a child .